We can make your brand’s Tweets stand out with Twitter Cards! Once the web developer adds some required lines of HTML code to your web pages, your website is ready for Twitter Cards. This is one of the reasons why our web design works hand in hand with your social media plan. A Twitter card is a summary of your web content, along with an image from your site, that is embedded into a tweet! When a you tweet a link to your website, at the bottom of your tweet, to the left of the reply button, you will see a “view summary” button. If you click on “view summary,” the tweet expands and the embedded summary will be displayed. This only happens with links to websites that have added the proper Twitter coding to their web pages. Why do I need a Twitter Card? When users Tweet links to your content, a "card" will be included in their tweet. This “card” is visible to all of their followers. Most people don’t like to leave Twitter unless the call to action gives them enough reason to click on the link. Twitter only gives you 140 characters. Wouldn’t it be great to include an added summary and a picture directly from your website? We think so! According to Twitter, there are 7 card types available. All Twitter Cards are built for Twitter's web and mobile clients. This means that Twitter users on their mobile phone can also see your Twitter Card. Summary Card: This card includes a title, description, thumbnail and Twitter account attribution. Amazon and Tumblr use the Summary Card. 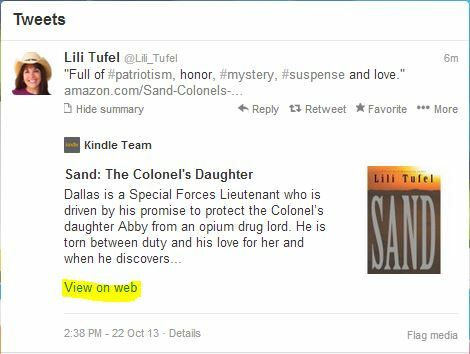 If you tweet a link from Amazon, you can see a summary of the product you tweeted. This is great for authors! Summary Card with Large Image: This card is similar to a Summary Card, but offers the ability to prominently feature an image. The New York Times uses the Summary Card with Large Image. Photo Card: Instead of “view summary,” you’ll see “view photo” on the tweet. Flickr uses the Photo Card. If you tweet a link from Flickr, you’ll see the photo in the tweet. Gallery Card: The Gallery Card highlights a collection of photos. App Card: The App Card displays the name, description and icon of mobile apps. It also highlights attributes such as the rating and the price. Player Card: The Player Card plays video/audio/media. YouTube uses the Player Card. If you tweet a link from YouTube, your followers can watch the entire video from your tweet. Product Card: A Product Card is great for retail items. You can showcase your products via an image, a description, size and price. Etsy uses the Product Card.